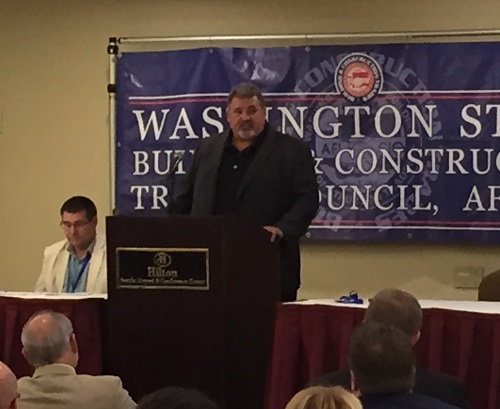 SEATAC — Lee Newgent, executive secretary of the Washington State Building & Construction Trades Council, told members attending the group’s annual convention Tuesday that it is time for government officials to act on the permit for Millennium Bulk Terminals in Longview. Labor, business and agricultural representatives from Keep Washington Competitive (KWC) have united in their support for the Millennium Bulk Terminals Project, which would create hundreds of family wage jobs, generate millions of dollars in new revenue for the county economy and build essential infrastructure for expanding the state’s trade and export products. In late May and June, hundreds of supporters attended public hearings in Longview, Spokane and Pasco to speak in favor of the project and the economic benefits it would bring to Longview and the regional and state economies. The hearings, hosted by Cowlitz County and the Department of Ecology, served to gather comments on the draft environmental impact statement for Millennium. Newgent, along with hundreds of labor representatives from a cross-section of labor and trade groups, were among the vocal supporters at the Millennium hearings.